Former Black Stars coach, Ralf Zumdick has finally confirmed that certain comments that were attributed to Abedi Pele, then serving on the FA's management team and the foot-dragging of the then management team to offer him a contract when his probationary period was due were the factors that informed his decision to leave for HSV Hamburg who had shown keen interest in him. 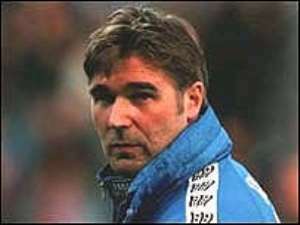 "Abedi decided to always criticise my appointment and the FA too did not help matters", the former coach said, and added, "even when he always made such unfortunate comments and I informed the FA to offer me a contract, since Hamburg had made an approach for my services, they too seemed not ready, and what I was to learn was that I was only using the Hamburg link to brow beat them and up my value." Zumdick made these revelations in an interview with Soccer Express after one of HSV Hamburg's training session in the AOL Arena late last week. Referring to his days in the country as one of the best in his coaching career, Ralf Zumdick claimed that he still follows the fortunes of Ghana football but expressed his disappointment over the last minute cancellation of a friendly match between the Black Stars and HSV Hamburg recently, when together with Tony Yeboah, who he refers to as "a huge figure in Hamburg" they had built massive publicity for that match. "I was very sorry for the reasons given - if that is true - that I was working against the progress of the national team", Zumdick lamented. On his alleged dealings to have Bernard Don Bortey and Kwadwo Poku in Hamburg the former national coach and curent assistant coach of HSV Hamburg explained that "Kwadwo Poku to me is one of the biggest talents in Ghana and judging from the way I gave him his first exposure on the international front during the 2001 Kotoko Africa campaign, and still offered him another chance to prove himself in King Faisal, and even to the Black Meteors, I only felt I should give him another chance, which in fact, is very rare these days in Europe with the approval of the Ghana FA and King Faisal which was then the club of the player." Zumdick further explained that though the player impressed during the trials, the authorities of Hamburg were aware of the then impending Olympic Games qualifier against the Amaglug-glug of South Africa and hence released him on time but said he was shocked when he heard the news that the player had been sidelined for that encounter as a result of the trials. With Don-Bortey, Zumdick denied flatly having anything to do with his trials. As to whether he was still desirous of "giving another chance" to Kwadwo Poku Zumdick's answer was simple: "no chance, because I know he has signed for FC Mydjiland in Denmark. I watched him play in a tournament in that country but when I even wanted to have a word with him, the President of his new club pulled him away." Expressing his views on the "German Invasion" in Ghana with regards to the number of German coaches handling the various clubs, Zumdick said he had no problems with that but opined that Ghanaian clubs must desist from the mindset that it is only the German coach that can be good for them. He intimated that there are some brilliant local coaches out there that can perform when offered the opportunity. Zumdick was full of praise for Messrs Joe Aggrey and Rashid Bawa for their roles in ensuring the Black Meteors' qualification for the Olympic Games. He would not leave the fans out for their support as well but reserved the biggest credit to the playing body and the technical staff.